Why are you not eating pizza in Lake County right now? There’s no escaping it. Pizza is now in our DNA. If we have pizza withdrawal for too long, we could possibly die! 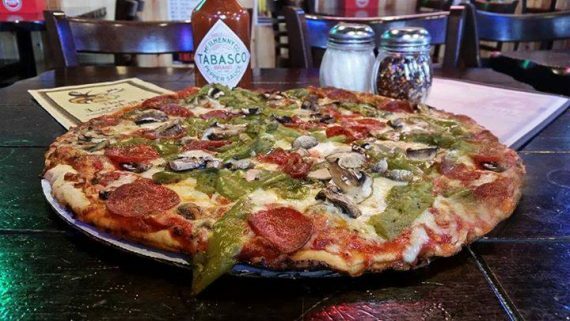 The Chicagoland area is known for its pizza and that’s no different in Lake County. Pizza’s long history begins in ancient Greece where these people covered the bread with oils, herbs and cheese. The modern-day version of pizza originated in Naples, Italy around the 18th or 19th century. Apparently, the first pizza was made for the Royal Palace of Capodimonte in 1889 (which used to be where the kings and queens of Naples and Sicily resided and is now a museum/national gallery). And the rest, my friends, is history. Well – since we’re on the subject of pizza in lake county, Restaurant Week: 10 Days to Savor is rapidly approaching. The delectable event runs March 1-10, 2019. These are the top 10 pizza places in Lake County to devour a slice of pie and to scream ‘radical,’ for Restaurant Week. Shout out to Leonardo, Donatello, Raphael and Michelangelo for the shameless pizza promotion. You might have thought this was strictly a steakhouse, but nay we say you pizza amateurs because the Grayslake eatery can cook a mean wood-fired pizza. Their menu is highlighted by smoke salmon, Chicag0-style sausage, spicy soppressata, Mediterranean, smoked cheese sausage or pepperoni, tarte flambe, roasted veggies,, Margherita barbecue chicken and Italian. Devour the pizza and spit out the peanut shells on the floor. Bill’s Pizza & Pub is a family-friendly restaurant, since 1957, with a unique, comfortable, rustic, Northwoods-inspired dining room with incredible wildlife mounts. World’s renowned first double-decker and famous thin crust pizzas are outstanding! Their menu also has delicious sandwiches and desserts. The atmosphere is relaxed, the beer is cold and served in a frosty mug, and the food is great. It’s like being ‘transported to another place and time’ in Highwood. This restaurant, reminiscent of vintage Italy, has a menu that includes pizza fruit dishes, breakfast, salads, pasta, Piatti, contorni and a slew of other delectable items. This Lake Forest restaurant is a contemporary and casual restaurant that offers rustic Italian fare like delicious slices of pizza pie. The neighborhood Italian cuisine also offers scrumptious wine options and artisan doughnuts. If you haven’t had Giordano’s by now, you must have been living under a rock. The catalyst pizzeria of Chicago is a deep dish spot known for its famous stuffed and thin crust. Their menu also includes great pasta, sandwiches, soups, salads and desserts. There are also over 40 other locations around the Chicagoland area, including Buffalo Grove. The Lincolnshire pizza, brew and other fare establishment creates artistic beers and has a menu that features have oven hand-tossed produces 12 different brews and also crafts their sodas. The menu also serves an array of wood-fired pizza that includes sausage, BBQ chicken, pepperoni & four cheese, Hawaiian, Half Day, shrimp & artichoke, cheesy, Margherita, sundried tomato pepper, white and truffle. This American bar and restaurant serve breakfast, lunch and dinner. The Northwoods pub & eatery offers your favorite pies plus salads, seafood, sandwich, pasta, ribs, tacos and much more. The oldest brewpub in Illinois still stands in Lake County. This MainStreet Libertyville provides an array of pizza flavors like Hawaiian, Margherita, Mac N’ Chees N’ Bacon, Vegetarian, BBQ Chicken and many more delectable pies. Pizza and beer go together like peas and carrots. The Lake Barrington brewpub delivers hearty comfort food and handcrafted beers located on a beautiful lake. The beautifully constructed facility made of recycled timbers that predate the American Revolution is a popular location for weddings. This family pizza favorite has been in the Gurnee community since 1990. The claim to fame of Saluto’s is in pizza and pasta, but also has delectable fare like artichoke heart fondue, toasted ravioli salads (that include a dressing with their renowned secret recipe) and more. Dedicated to the art of making hand-crafted artisan coal-fired pizza, this Wauconda eatery has a simple menu that allows them to garner a special attention to every ingredient in the building. With locally-sourced produce and dairy and the freshest quality ingredients, the Main Street pizzeria makes the perfectly balanced pie. The Slyce menu also features salads, sandwiches, tiramisu, gelato and cannoli. Continue here for the full details about Lake County Restaurant Week and click here for more pizza in Lake County. What about Lou Malnati’s? Great butter rust. As a proud resident of Third Lake, IL, I am absolutely delighted that Bill’s Pub North makes its home in our village, not be confused with Grayslake, IL (which has many great dining establishments, too). I’ve always liked The Silo.